The subject of this post could raise some eyebrows! Trust me, this is a good kind of cheating, not the Arnold Schwarzenegger kind. By “cheat day” I am referring to the 1 day per week I allow myself to relax on the disciplined nutrition plan I am following and indulge in whatever I want to eat. It is bliss! I started my Saturday cheat day off with a scrumptious brunch with Ozdane at one of our local neighborhood spots here in Singapore, Boomarang Bistro. It’s a great, casual restaurant/bar owned by Aussies and always packed with expats, the majority of which are Aussies. If you close your eyes and just listen to the chatter around you I swear you’d think you were back in Sydney. 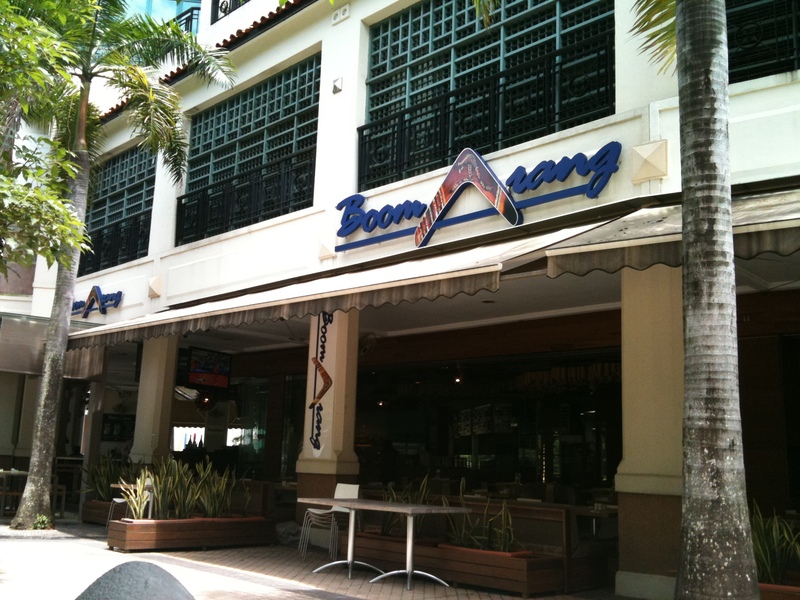 Boomarang just launched their new menu today, lucky us! I went for it! I ordered scrambled eggs with melted cheese, spicy Italian sausage, toast with butter and baked beans! It was scrumptious! I enjoyed every bite. So what’s the deal with this health kick that has me so excited about my cheat day? At the beginning of March I started a consistent exercise program including personal training sessions 3 times per week and reformer/mat pilates 2 times per week. I incorporate a cardio session into each workout every day also. Realizing I am no longer in my twenties where I can exercise moderately for 1 week and see instant results, I knew I would have to change my eating habits. It was more than that though, I wanted to eat healthier and feel healthier. I even met with a nutritionist as part of the PT program which I wouldn’t have even considered a few years ago. Five days a week my diet consists of things like egg whites, white meat, fish, veggies, brown rice, non-fat yogurt, etc. I eat as many organic foods as I can find here. I take vitamins every day. I think you get the picture. I don’t view this as some crazy, new-age diet but rather creating a healthier lifestyle through good nutrition and exercise. I find it quite easy to stick to this during the week as Ozdane and I prefer to make dinner on weeknights and I have the time during the day to prepare my meals. The weekends get more challenging when we are out with friends for dinner and drinks which is why it is so convenient Saturday is my cheat day. An added bonus I have discovered, which I didn’t expect, was the increased appreciation I have for the more indulgent, yummy foods I don’t usually have. It makes pizza, pasta, cheese, a big, juicy burger or a fabulous dessert seem like so much more of a treat. Who knew? I can say with complete confidence I will never become so extreme with my healthy eating that I stop eating things I love. That is impossible for me. I love food. I love trying new restaurants. I love trying all different types of cuisine. Not to mention one of the most popular activities here in Singapore is eating. There are amazing restaurants all over the city with every type of cuisine you can imagine. You could live here for years and still not have tried all the restaurants. That is one of my favorite things about Singapore. I believe everything needs to be in moderation. I just think right now this healthy plan five days a week is the winner for me and I am seeing and feeling the results. It has also brought this glorious thing into my life that I have come to love…cheat day! Oh, and the fun isn’t over yet! It’s date night tonight! Ozdane and I are trying a new restaurant here in Singapore, DB Bistro Moderne. French-American cuisine from Chef Daniel Boulud. I see divine food and exquisite red wine in my near future! Yum! Make sure you keep a Cheat Day for me over the summer! Miss having Sat morning breakfasts with you! Glad you have someone to share them with. Have a great date night…want to hear about the French place too!! So I guess the one thing I didn’t mention in my post was that the disciplined nutrition program tends to go out the window with travel. I try my hardest to stick to it but the food temptation tends to get the best of me! So of course I will be indulging when we visit this summer so don’t you worry! Good for you on being so discipline. I used to have an incredible will power … working out and eating in moderation. Somewhere along the way my will power got pushed by the wayside. I am getting back in to my yoga workouts, but being a single mom with a full time job and filling whatever time is left over with writing, makes it harder to find a routine. I found that if I pre-plan my weeks/months it is helping me stay on track. Guess my calendar is what I used to stay accountable. Oh … I think you need to have a regular Sunday post telling us (your readers) about where in Sing you ate, what you recommend, what you don’t recommend, etc. Love the suggestion on the regular Sunday post! May roll with that one! Thanks! !